First-cut haying continues while some 2nd cut dairy haylage will start soon. Hay making weather was generally good in early June, but some more recent storms have rain-damaged some hay. Rains will help 2nd cut regrowth. Yields have been quite variable, ranging from good in eastern Ontario to some winter injured areas in western Ontario reporting yields 50 – 80% of normal. Remove large hay bales from the field as quickly as possible. Large square bales should be removed from the field the same day they were baled to prevent them from taking up ground moisture. Minimizing the tractor and wagon traffic before any regrowth occurs prevents alfalfa crown damage and subsequent yield loss. The cost of indoor storage is only a small proportion of the total cost of producing hay, and is recoverable by maintaining forage quality and minimizing spoilage losses. It is essential that hay storages have adequate ventilation to enable moisture to dissipate from bales. Tightly stacking bales should be avoided. The use of pallets prevents spoilage of the bottom row of bales. As a minimum, large round bales of hay stored outside should be properly covered with bale tarps to shed rain and snow to minimize spoilage losses. With current hay prices and the cost of producing it, leave large round bales on the ground, unprotected outside is very costly. Six inches of spoilage around the outside of a round bale represents 20% of the volume of a 5 foot diameter bale, and 25% of the volume of a 4 foot bale. With higher hay prices, this is an expensive loss. Tarping large round bales is better than no protection at all, but bales placed directly on the ground will absorb moisture and spoil. Wicking of moisture can be very significant, so use pallets or crushed stone to keep them off the ground. Bale tarps are notoriously difficult to keep in place on stormy days. Also after baling, insufficient ventilation under the tarp holds humidity under the tarp during “sweating” and slows curing. Managing forage fertility by soil testing, and commercial fertilizer or manure application is important to both yield and stand longevity. Low soil fertility reduces both forage yield and persistence. 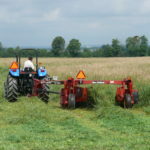 Forages have high P and K removal rates. A tonne of mixed hay removes about 14 lbs P2O5 and 58 lbs of K2O, currently equivalent to about 1.5¢ per lb of hay. Without replacement with manure or commercial fertilizer, soil tests will drop quickly within the life of the stand. Only 4 years of hay production without nutrient replacement can significantly lower soil tests by 6 ppm of P2O5 and 40 ppm of K2O on many soils. If a soil test is below 120 ppm K, you can expect a yield response from top-dressing potassium. 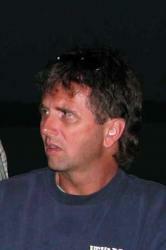 (http://fieldcropnews.com/?p=3760 ) Fertilizer should be applied immediately after harvest to minimize wheel traffic damage. Potato leafhoppers (PLH) have arrived, although they have yet to be reported at above threshold levels. PLH can dramatically reduce alfalfa yield and forage quality. New seedings are very susceptible and can be permanently damaged. Adults are 1/8th of an inch long, lime-green and wedge-shaped. They insert a stylet into a leaf midrib and inject a toxin that results in a wedge-shaped “hopperburn”. Damage is often confused with moisture or heat stress. Reduced stem elongation, root development and stand vigour results in stunting and slow regrowth. Once hopperburn is observed, the damage is done and it is too late for control, so scout and be prepared to spray. http://fieldcropnews.com/?p=3902 Farmers in the high risk areas north of Lake Erie should consider growing PLH resistant alfalfa varieties.